Experience it all—Chicago's glorious skyscrapers, historic buildings and modern marvels—on Mercury, the Skyline Cruiseline's most popular tour, the Urban Adventure Cruise®! Relax and unwind on a scenic Chicago River boat tour and Lake Michigan cruise. You’ll enjoy lively narration and stories of Chicago's rich history as you take in the Willis Tower, Aon Center, John Hancock Building, Museum Campus, Marina City and more. It's fun for the whole family! For groups of 20 or more, call us for a group rate: 312-332-1368 (group rates available Sunday - Friday). Ask about our school field trip days. Glide along the Chicago River and Lakefront as you're dazzled by the sparkle of the city at night. Enjoy breathtaking views of the dramatic skyscrapers and Buckingham Fountain's spectacular light display. Hear lively commentary and wave your complimentary “neon light wand” as you feel the night breezes and see Chicago’s skyline transformed into a glittering jewel. Family-friendly boat tours are our specialty! SPECIAL OFFER: "Wine Down" with us any Thursday or Friday evening (through August 31) or any Friday evening (September 7 - October 5) and enjoy a special date night offer: two tickets + a bottle of wine to share for $60 (retail $94)! For groups of 20 or more, call us for a discount: 312-332-1368 (group rates available Sunday - Friday). 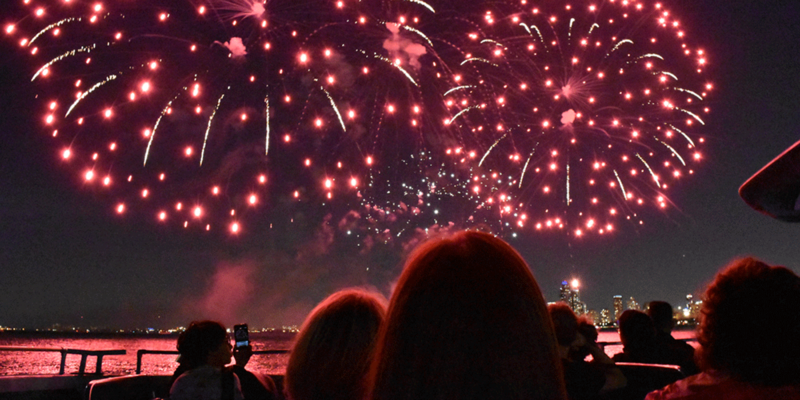 Enjoy a stunning getaway right in the city with our Chicago fireworks cruises, departing Wednesdays and Saturdays every week during the summer months. 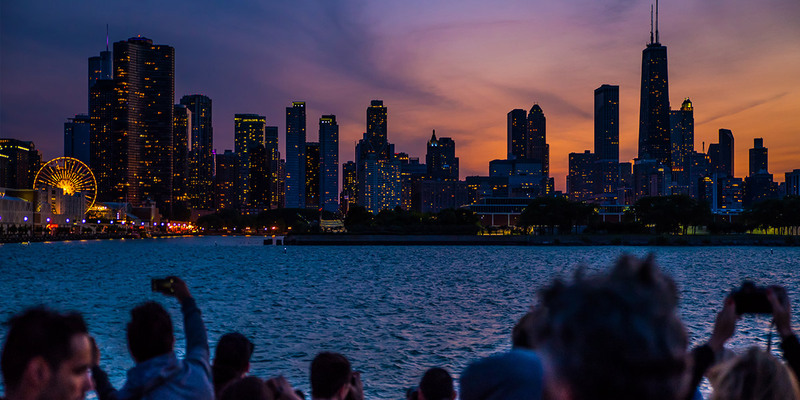 Capture stunning photos of Chicago’s lakefront skyline on a lively narrated sunset cruise past Buckingham Fountain, Museum Campus, the Chicago River Lock and more. Then put on your complimentary “3D” glasses and enjoy a musical soundtrack as you take in an unbeatable view of a spectacular fireworks display! Dogs on boats? Yes! 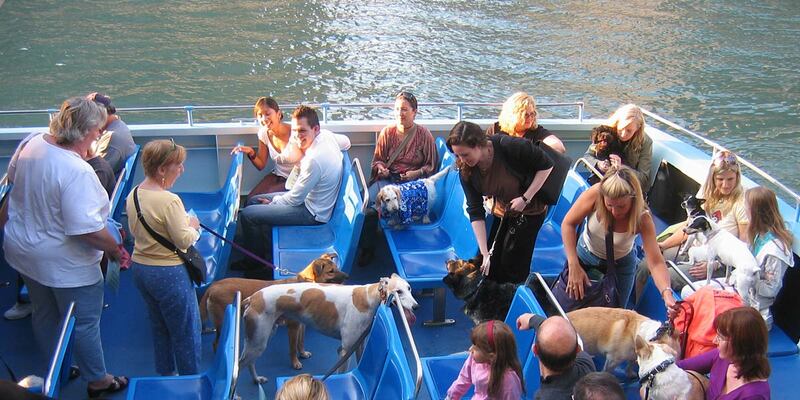 Bring your pooch on a leash and enjoy quality time with your dog while cruising on Chicago's waterways. Sit back, relax and soak in the city as you enjoy a lively narration of Chicago’s rich history and architectural marvels with dog-friendly highlights. Keep your dog on your lap, in a seat or on the deck. Our dog cruise boat offers plenty of safe outdoor seating, water bowls and a special newspaper-lined restroom for your pet. Enjoy a great day out of doors with your favorite companion. Halloween Themed Canine Cruise: Saturday, October 6 and Sunday, October 7. Learn more. Groups of 20 or more, call 312-332-1368. See Chicago by boat and by bus and save! Guests can choose to enjoy a Mercury Urban Adventure plus receive a two-day Hop On Hop Off Tour ticket from Chicago Trolley & Double Decker Co. 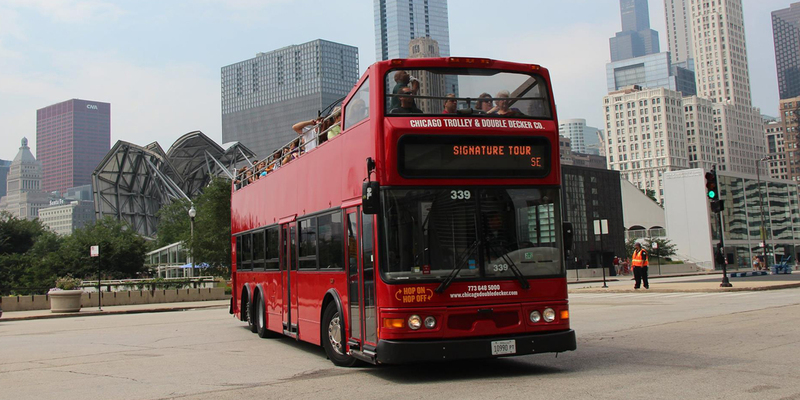 The two-day Hop On Hop Off ticket includes the Downtown Tour as well as the Night Tour and Wrigley Field/Lincoln Park Zoo Route. View the route maps here. Guests not only get the opportunity to enjoy a beautiful cruise along Chicago’s skyscraper-lined river and lakefront, but also unlimited boarding at all 18 stops along Chicago’s Trolley & Double Decker Co.’s routes. Both tours offer informative commentary and spectacular sights. Please note: Land, River & Lake package holders that purchased online at mercurycruises.com must visit Mercury Cruises' box office on the Chicago Riverwalk at 112 E. Wacker Dr. to pick up tickets before visiting Chicago Trolley & Double Decker Co. Arrange a school field trip or summer camp group outing to spend a day of fun, science and learning on Chicago’s majestic river and Lake Michigan! Cool experiments, slimy creatures and skyline views make for an unforgettable Chicago science field trip students will never forget. 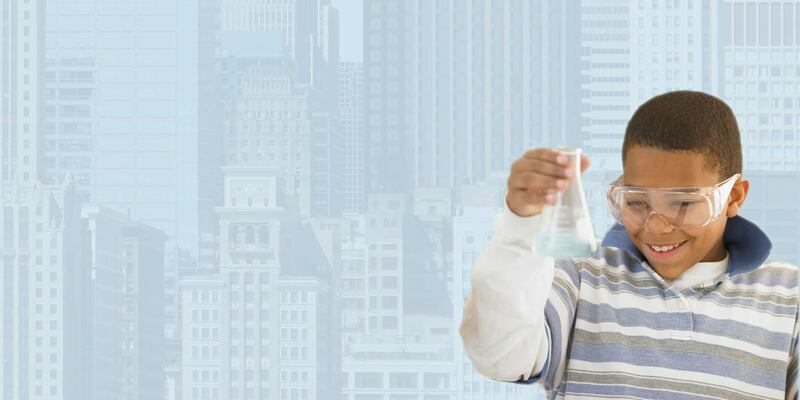 Learn more about our educational "Science is Fun Cruise" for school, camp and scout groups here. Call us today for a VIP group reservation*. Minimum group size of 30. Sorry, no individual tickets are available. Call 312-332-1368 or email grouptours@mercurycruises.com.